Everyone in the boating industry knows that Christian Grande has been one of the youngest designers to be included in the palmares of the yacht design world, starting in 1992, when he conceived the new Sessa Marine boats, a historical brand “Made in Italy”. Naturally, with more than more than 70 yacht projects in 20 years, Christian’s experience and interdisciplinary vision has led him to collaborate as a teacher and lecturer for important academic institutes and during relevant international events focused on design and lifestyle. He also works for renowned brands like Sacs Marine and Sanlorenzo. 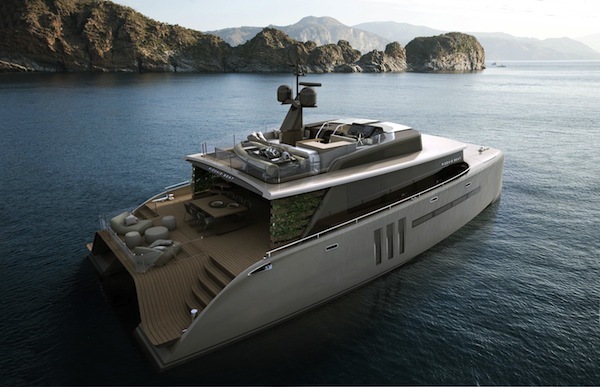 His latest concept for a new catamaran which is “Picchio Boat” is just awesome. 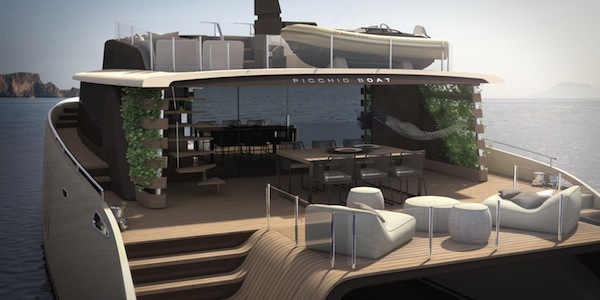 The “Picchio Boat” concept incorporates the values of family life, respect for nature and a eulogy for slowness: the possibility to take the necessary time to completely enjoy your trip, for the trip’s sake; to enjoy the navigation and the surroundings and freely express your will and personal passions. These are the starting bases for the design of this boat, filled with style and technical solutions dedicated to a quiet and contemplative lifestyle. Christian chose a 21 meter displacement catamaran to transform a dream into reality. It’s a boat to cruise for extended periods in total comfort, fully appreciating the natural beauties and the intimacy inherent to sea travel. A sort of recreational island to be lived, without any need to show or boast. The “recreational” intent is immediately visible in the interiors. The central salon, complete with a bar and furnished with a very large sofa and dining area, also has a peculiar submarine observatory: a glass platform integrated and level with the salon deck and overlooking the sea between the hulls, giving a suggestive vision of the sea and its inhabitants, especially at night with the aid of specifically designed underwater spotlights. From the salon to the lower deck, the vast living area potentiality of a catamaran is fully exploited: two spacious VIP cabins with private bathrooms, the galley, and a “children’s room” with foldaway berths and a super sofa, giving them a real and generous playground. 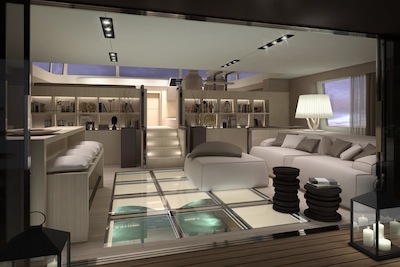 The piloting area, with another comfortable sofa, gives access to the master cabin, equipped with a glass floor under the bed, that seems to be floating on an illuminated sea. There is also a big wardrobe, vanity desks and an even bigger private bathroom with a double basin, shower, whirlpool bath and separate WC. The character, the desires and the vision of the owner are fully expressed in the final product. Indeed the whole boat, despite its’ generous dimensions, is discreet and gentle, recreational and respectful of the natural environment. The colors are respectful and gentle too: bronze, metallic champagne and moka, borrowed from the cliffs, bays and creeks of the Mediterranean (it’s not new, for Christian Grande, to conceive his boats paying homage to the most beautiful coastal areas). The surfaces are soft and curvy, and all of them are related to the marine habitat. Natural and animal elements are evoked by the deck floor, fully covered with teak planks the color of sand and curved and bended like desert dunes, especially in the cockpit area, as if they were really shaped by wind and water. Another homage to nature is represented by the bow, shaped around the central tunnel in a peculiar imitation of the mouth of a Manta. Everything is created to be gentle both in form and in material, including the choice of pastel colours and continuous glass to lighten the profile of the deckhouse, and terminating with two vertical gardens on both sides of the external living area, one of them offering a relaxing hammock. A stern terrace bounded by glass, with smooth sofas and cushions, creates a real view of the sea, and is repeated on the fly bridge, with a lounge area and sunbathing mattresses on the forward balcony. Now what more could a diva ask for??? ?